Home made peanut butter cups are easier than they look. They take about 30 minutes of actual work, and then just a few hours of waiting while they set. They are very worth it! And hardly last more than a day in my household! In a bowl, mix together the peanut butter and icing sugar. Once smooth add vanilla and incorporate. Set aside. Using a double boiler, (or a glass bowl over a boiling pot of water), start melting the 2 Cups of milk chocolate chips (on medium low). Once all of the chocolate chips are almost melted, take it off the heat and stir quickly (the heat from the already melted chips will finish the job) and get ready to fill the mini cups! Side-note: You can use dark chocolate if you like (I’ve also used white chocolate). One of my favorite variations is milk chocolate on the bottom and white chocolate on the top. Now, time to make your peanut butter cups. Using a small spoon, or a piping bag for icing if you have one, put a dollop of the chocolate in the bottom of the mini cups (just enough to make an even layer). 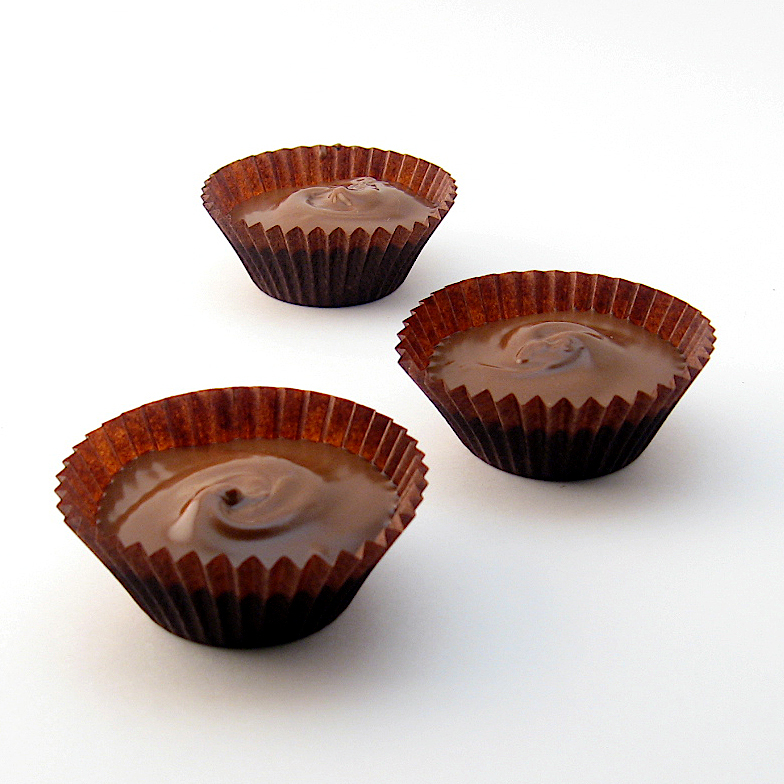 Using a spoon, scoop out a small ball of the peanut butter mixture and place it in the center of the mini cup. Now pipe, or spoon, more melted chocolate on top, making sure to cover all the peanut butter. I like to make a swirl on the top once I’m done, but you can also top with a salted peanut instead. This recipe makes about 36 cups (you’ll end up with a little bit of the peanut butter mixture left) but don’t worry, it tastes pretty good just on it’s own Enjoy! WHAT IS ICING SUGAR. iS THIS POWDER SUGAR? NEVER HEARD OF IT. Hi Mary, Yes, same thing. I guess I’ve always called it that even though it is technically powdered sugar. I will update my recipe to be more accurate, thanks! Where did you get the peanut butter cup papers? Do we have permission to link in this manner from this post as well as your current blogs in the future? In addition, we would similarly like to use this recipe and its accompanying photo in our e-mail newsletters and eCookbooks. Often, for instance, we develop and promote blogger eCookbooks. All of this would drive traffic to your blog. *You would receive credit for your recipe with these links. As you’ll see, we do not post the recipe in full, but rather link out to it just as we do on the site. Please let us know what you think! I made your peanut butter cups for my husband for Valentine’s, he loved them and wouldn’t believe me when I told him I made them and didn’t buy. High compliments from my chocolate connoisseur. But thanks for your great recipe, sure I will be using again and again with a compliment like that. 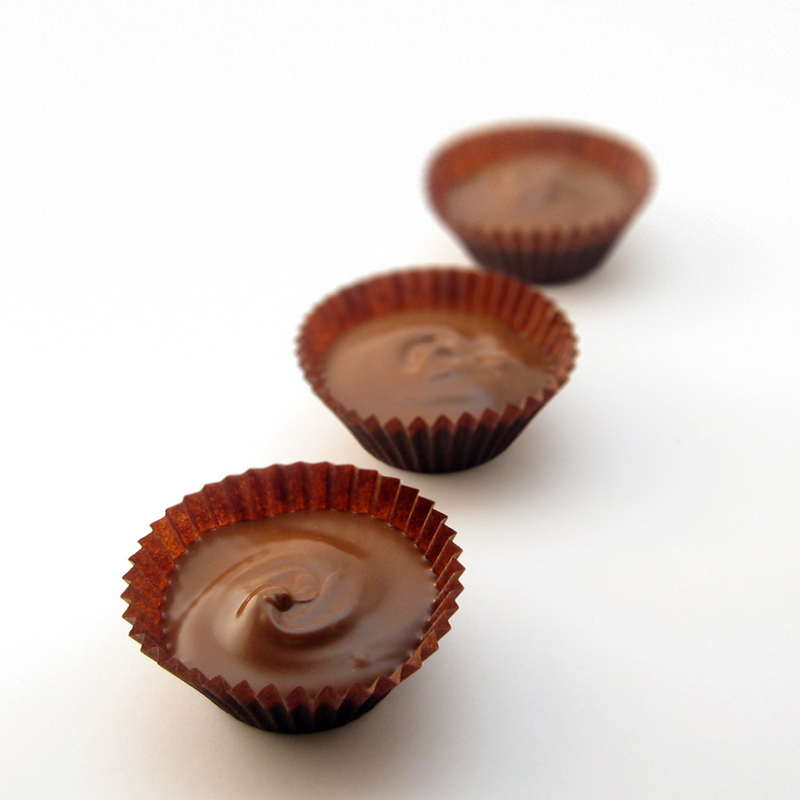 LOVE your homemade peanut butter cups. Gotta check out more of your fab blog!! Unfortunately I have prepared these with white cupcake shells and they aren’t as pretty as they are delicious. Do you think that they will package well if I remove the shells after they have cooled? I think it depends on how long they will sit in the packaging, and if they will get warm. Once they warm up they might get a bit messy. Right before you put them in the packaging you could pop them in the fridge for 15-20 minutes to really cool them down, and just make sure they stay cool and you should be fine! Thanks for trying my recipe, glad they taste good! More successful than I expected! Very simple and delicious. Mine required more than two hours to cool completely but the four hours was a good estimate. Next time I will be sure not to be skimpy on the peanut butter filling as I was this time. Also, maybe using semi-sweet would be a tasty variation. Delicious recipe! Thanks Leslie! So glad you tried it out and liked it. I found the first time around I did not use enough peanut butter either, but the next time they were perfect! If you have photos i’d love to see how they turned out Thanks again for letting me know you tried and liked my recipe! Wow, these look incredible! There was a chocolate shop where I used to live that allowed you to come in and make your own chocolates, and the peanut butter cups were always my favorite to make. I need to try it at home, so thanks for the inspiration! Looks like the hardest part of this recipe would be waiting til they cool! We have been known to sneak a few before they are cooled… melted chocolate and peanut butter is also pretty good! I was just thinking the same thing! These look wonderful. Thanks so much for sharing.